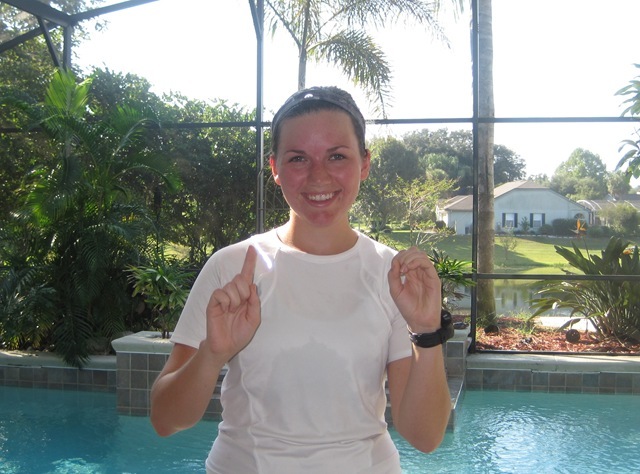 Considering today is 10-10-10 (October 10, 2010), what better day then today to try for 10 miles!? 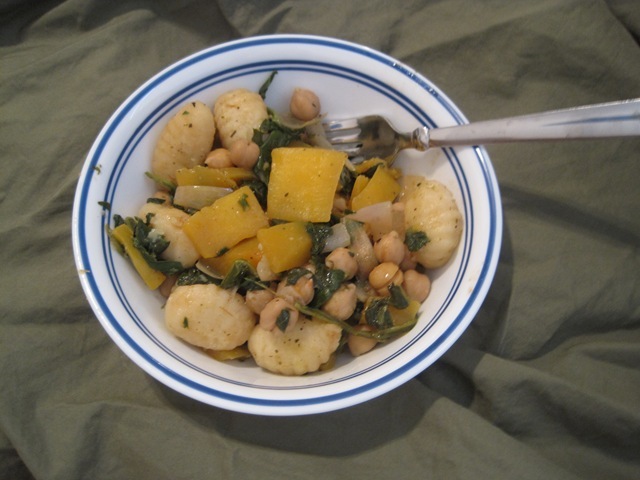 Last night, I had leftover Spinach, Chickpea, Butternut Squash, Gnocchi for dinner. 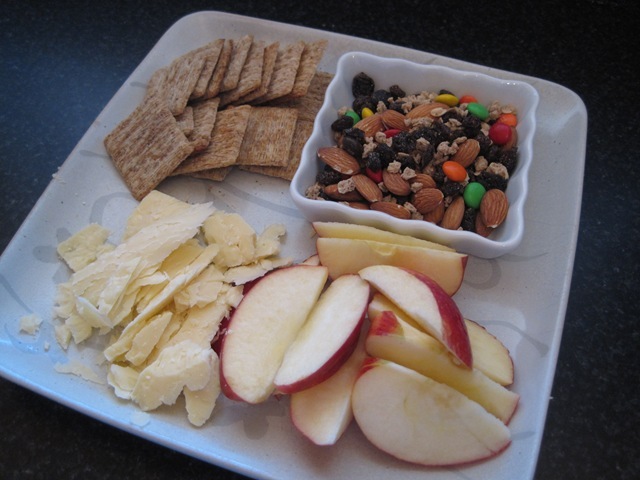 I also ended up having a glass of milk and apple+pb before going to bed because I felt like I needed a second dinner. 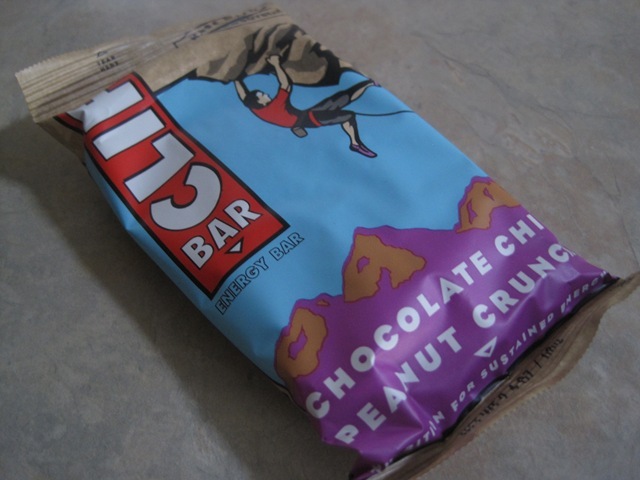 I woke up this morning around 7:30am and had a pre-run CLIF bar. 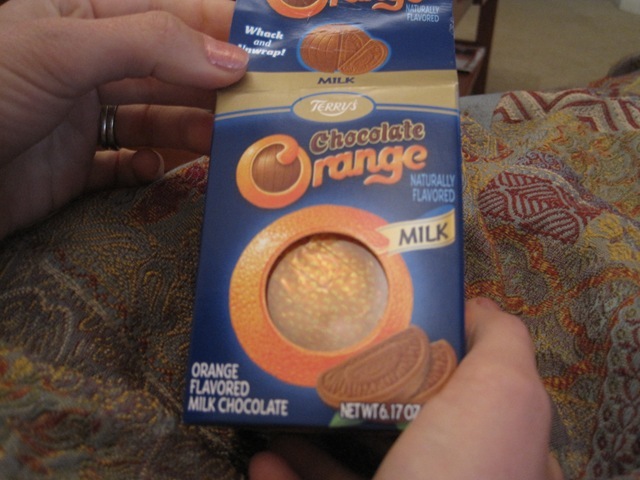 I usually eat half for 7.0 or less miles, mainly because I’ll be back to eat a full meal in an hour or so, but I knew I would be eating for a while. 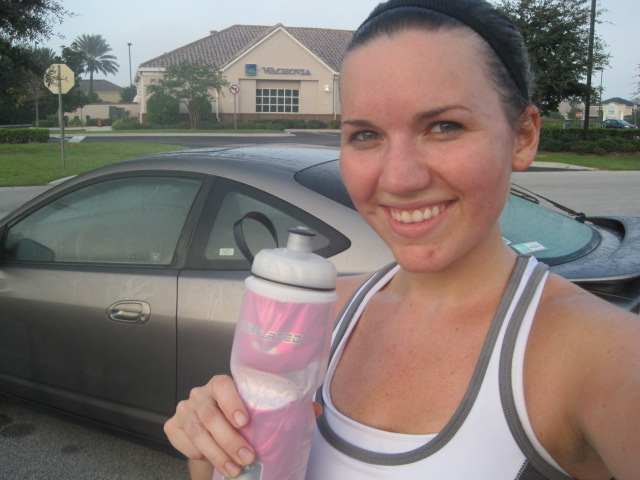 I set out this morning determined to finish under a 10:00 min/mile pace. 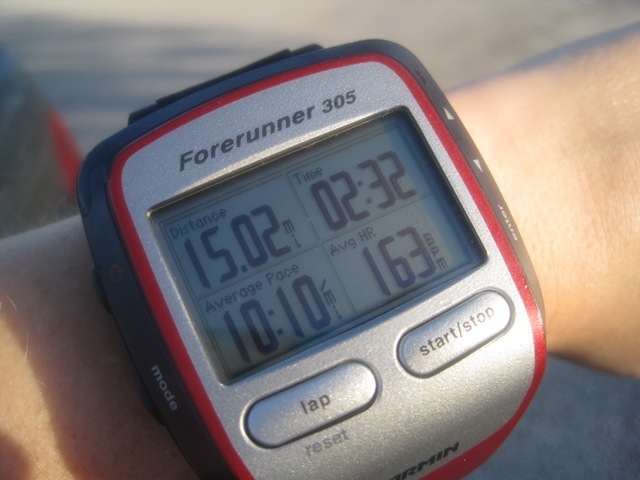 I started off slower to save energy, and built up speed as I got farther along. 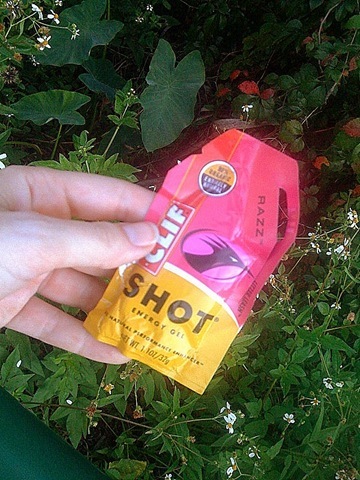 …and had a CLIF Shot. I love the RAZZ flavor! After my mini-break, I continued on my merry way. I didn’t want to litter, so I used the litter leash to hook my used goo packet onto my amphipod belt. 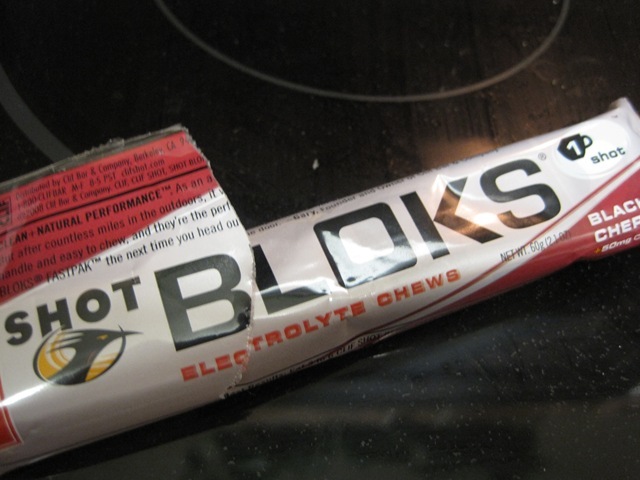 I feel so much of a difference when I take an energy gel on long runs rather than forgoing it. 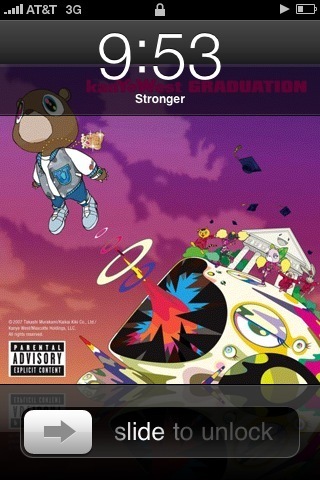 My favorite running song that pumps me up came on towards the end of my last mile: Kanye West’s Stronger. It was just the extra boost I needed! I finished my long run in 1:36:21! 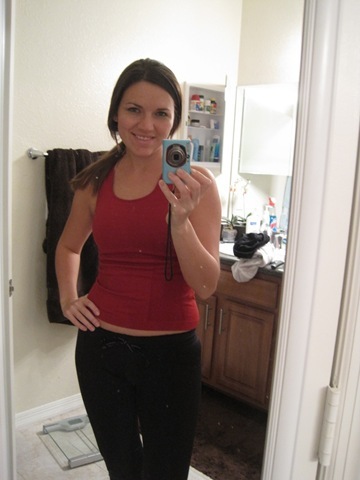 I felt so much healthier, stronger, and more in shape then I did even a few weeks ago at Miracle Miles 15k. Hooray for negative splits! My average pace ended up being 9:38 min/mile! Aaaaaaah! This is so exciting for me! 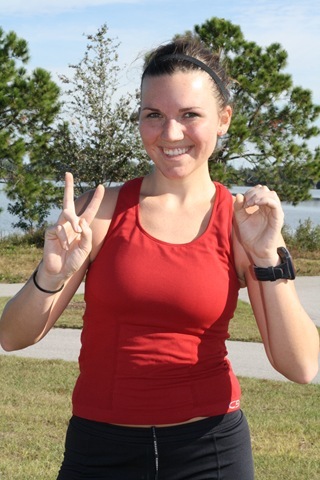 Not only did I get back to double digit runs, but I finished feeling stronger than I have in almost a year! Because I want to track my progress in as many different ways as possible, I have started wearing the heart rate monitor part of the Garmin Forerunner. It annoys me to wear it, but I want to see if I can learn anything from the data. Guess what?! 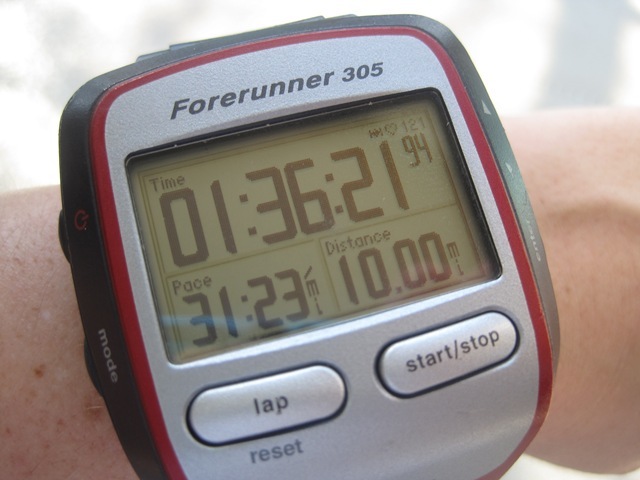 That means I did 10.0 miles, below a 10:00 min/mile pace, before 10:00 am, on 10-10-10. Holy nerd alert. I better stop now. Sometimes, life gets in the way of your plans. 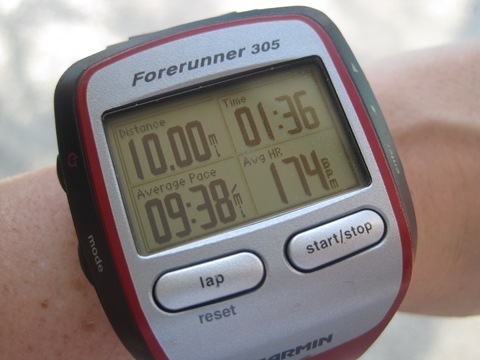 In a perfect world, I would follow a perfect training schedule, with 10% weekly mileage increase, long runs on the same day of the week, a perfect balance of speed work, long runs, etc. etc… all the things you are “supposed” to do according to the books. My life is far from perfect, and so is my training schedule. Like many other runners, my work schedule changes each day, and I have to plan my running times around when I am not working! I’m leaving for BFF Debbie’s wedding in New Jersey on Friday morning, before 8:00am, and won’t be back until Monday afternoon. That leaves NO time for a long run during the weekend! I decided to go with tonight. Why wait? My goal for the night was to “make brown rice taste good.” They have only had it once before and thought it was disgusting and bland. I had no problem coming up with something to make for them! 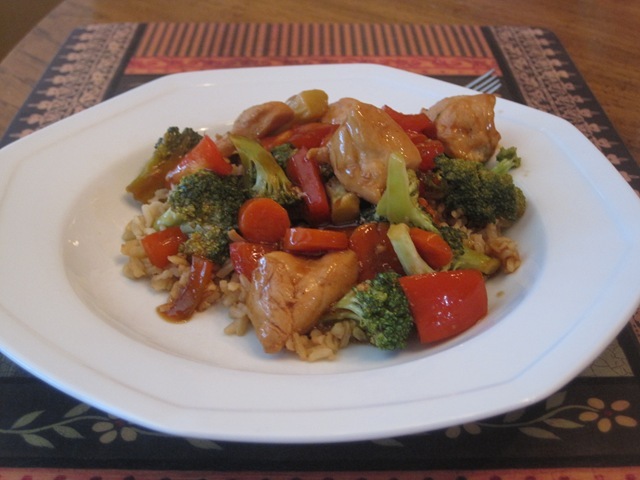 I made chicken stir fry, with red peppers, broccoli, and carrots. 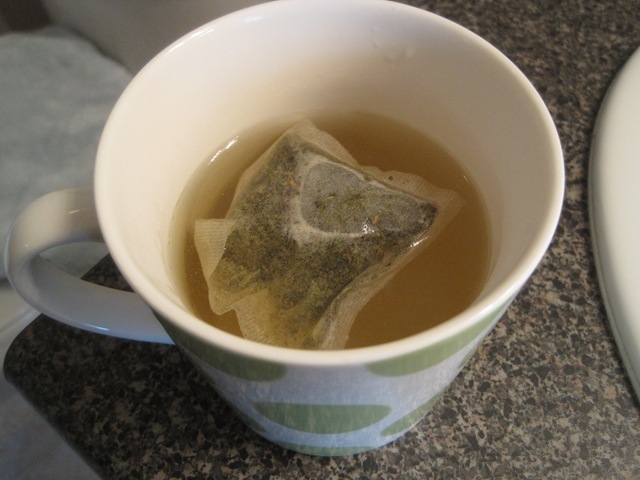 I boiled veggie broth instead of water to add flavor to the otherwise bland brown rice. 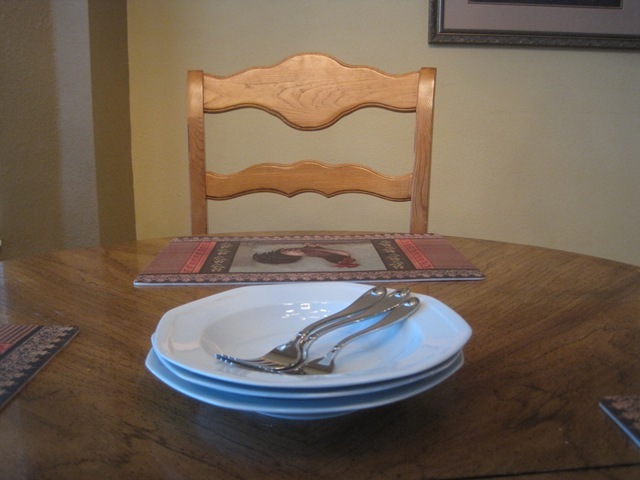 I set the table, and waited for everyone to try their dinner. 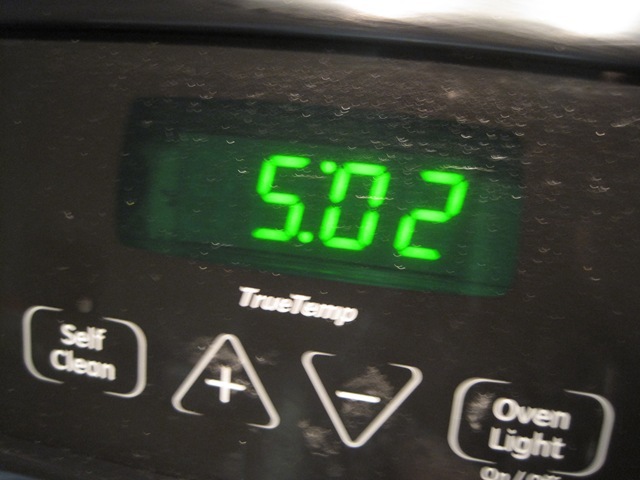 The clock was ticking, and it was already 6:42 when we sat down. It took extra long because I haven’t ever cooked in their kitchen, and had to search for everything. According to the girls, it was a success! Mission accomplished. I waited 15 minutes or so, and headed upstairs to change. By the time I laced up my shoes and got out the door, it was 7:18pm. The sun sets here at about 7:45pm, so I knew there was no way I was going to squeeze in the 8.0 miler I had planned before dark. I ran about 4.5 before the darkness finally set in. Luckily, they live on a well lit-street, so I was able to finish up the run on their road. The road is only 0.25 miles long, so I literally ran up, and down the street. Up. Down. Up. Down. Le sigh. It got sooooo boring, that I finally stopped after 7.0 miles. My legs felt great, but I was kind of freaked out running in the dark. I kept hearing "weird noises” and dog barks. I’m a wimp, but at least I’m cautious. I know that I’m not invincible. So I didn’t get in the 8.0 miles that I wanted to, but there is always next week. 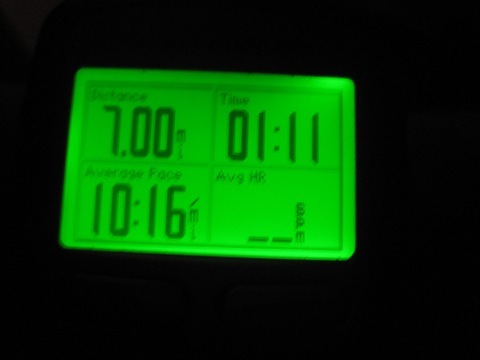 I felt good about tonight’s run, and much stronger than I did on Saturday’s 7.0 miler. Progress! I kind of liked doing my long run at the end of the day. I feel less bad about coming home and lounging around in pajamas for the next few hours, if it’s what I’d be doing anyway. 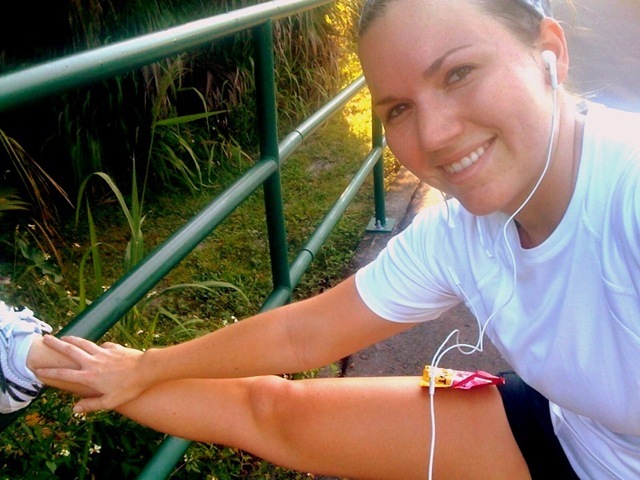 Do you prefer to do your long runs (or long workouts) in the morning or at night? What are your reasons? Do you do them on the weekends, or another day of the week? 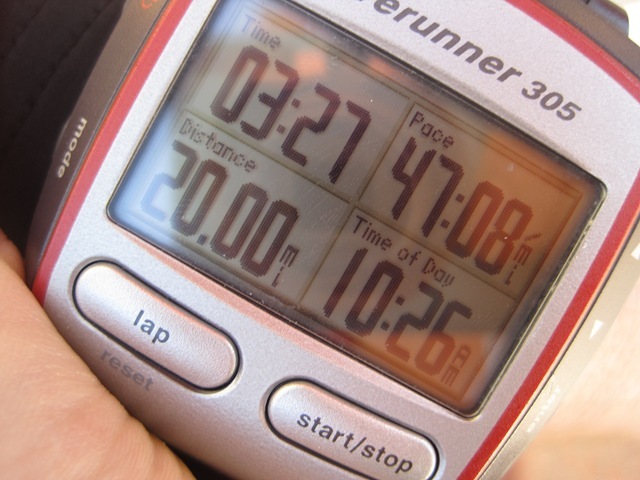 Twenty Miles… I did it! When the alarm went off at 5:00 am this morning… I jumped out of bed. I was actually really pumped up for this run. I had a few different outfit choices ready to go. The weather is cooler than usual, and I wasn’t sure what I would need. 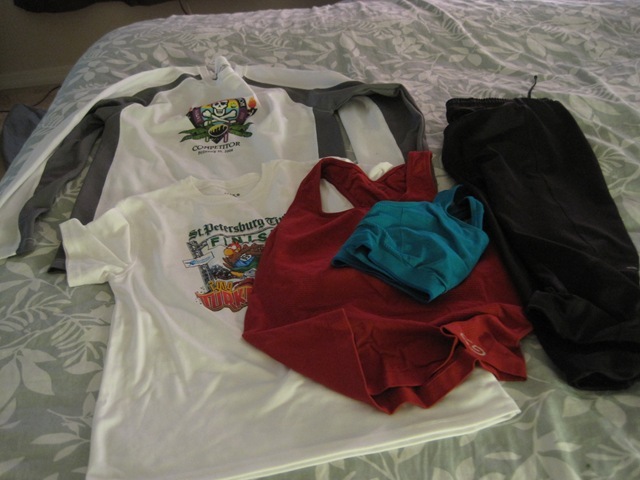 I ended up layering my clothing, and lost the excess as the run went on. 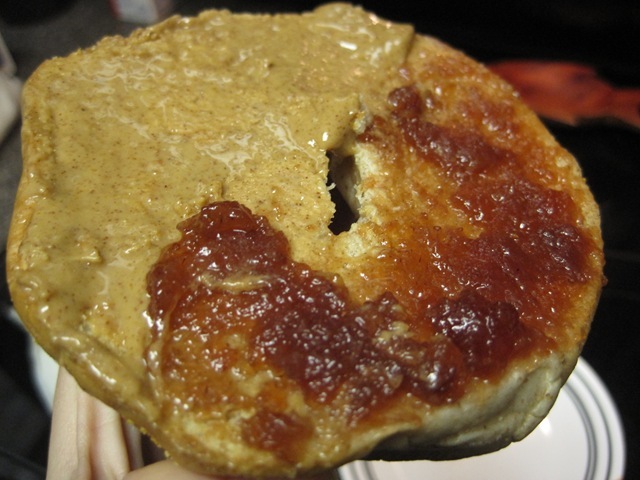 …and fueled up with half a bagel with almond butter and raspberry jam. 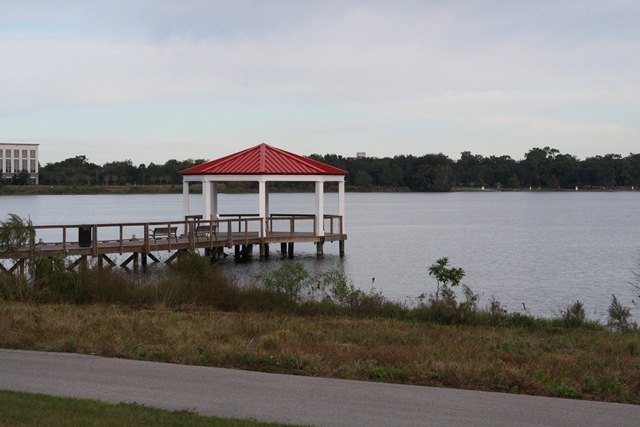 I picked up Caitlin and we headed to a more scenic area to get our run in. It’s getting pretty boring running around our apartments. Once we got started on our run, things were going great! We were trying to take minimal walking breaks and maintain around a 10:30 min/mile pace. 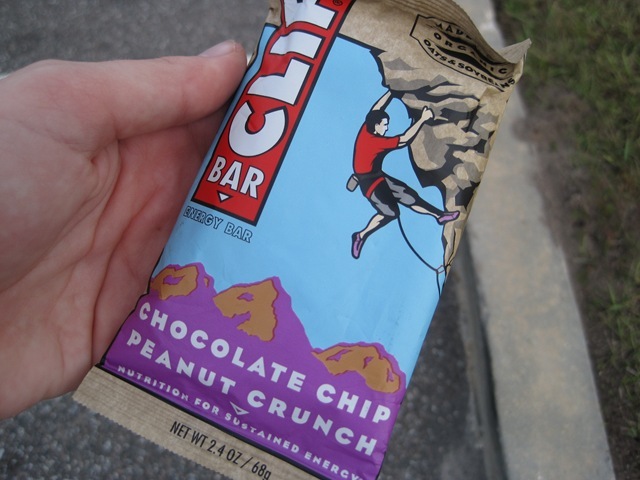 …and once my stomach started growling (since my breakfast was small) I broke off chunks of CLIF bar. 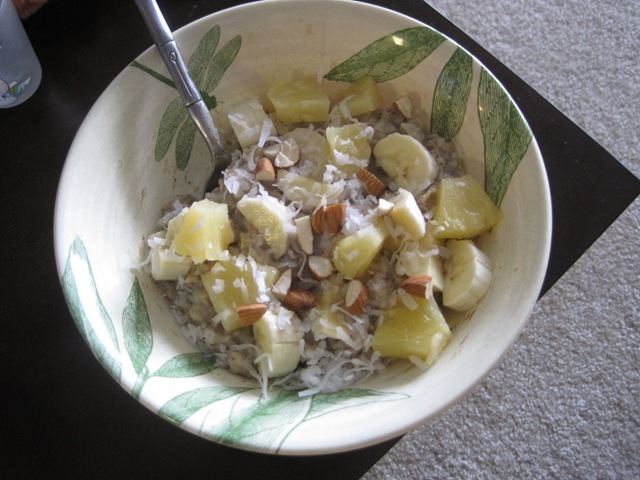 It didn’t bother my stomach at all because I’m used to eating the entire thing before a long run. The first 10 miles seemed to be dragging, mostly from anticipating how much farther we had to go. My Garmin battery died around mile 15 and by that point I was just ready for it to be OVER. I challenged Caitlin to see if we could finish the last 5 miles under a 10:00 min/mile pace, making our total time under 3.5 hours. She accepted, and it was game on from there. I was so incredibly proud of us! 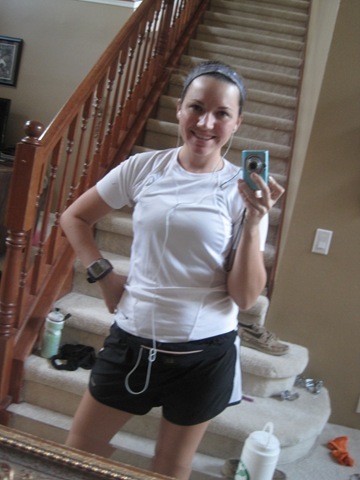 I remember thinking this summer that running 20.0 miles a week was a lot. Here I am now running 20 miles in one morning! Such an improvement! 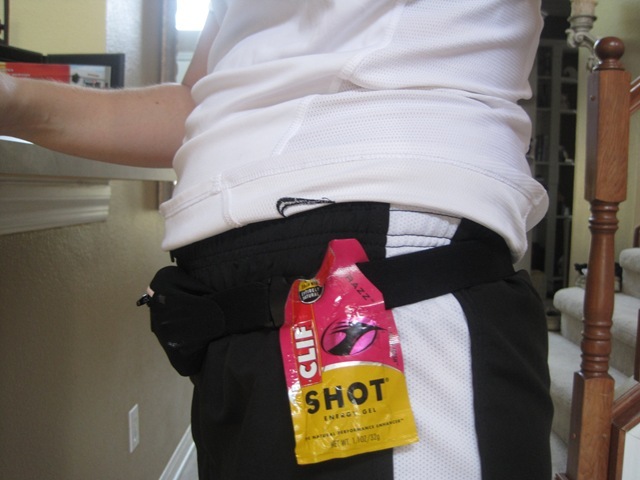 With my toe surgery stuff, I thought that I was going to be out of running, and the marathon goal was shot. I was so wrong! It was a minor setback, and if anything made me more determined to run strong. I’m not going to lie… we were soooo happy to be done. I have never been so happy to see my car. 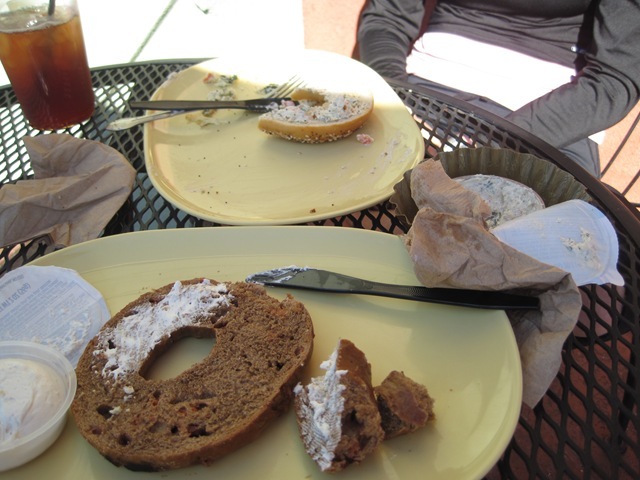 As soon as we were done with our run, we headed to Panera Bread to fill our bottomless pit stomachs. Caitlin finished an entire egg soufle + 3/4 of bagel in the time I finished half a bagel. She is a speedy eater! LOL. 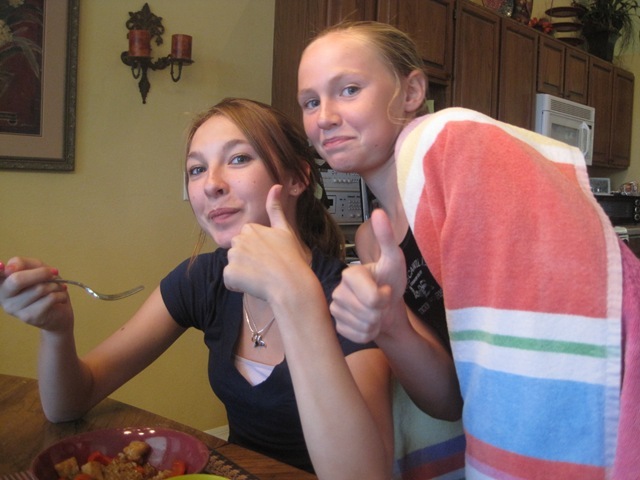 Once we got back to Caitlin’s… we were already hungry again. Can you believe it? Caitlin made us some delicious mac n’ cheese. 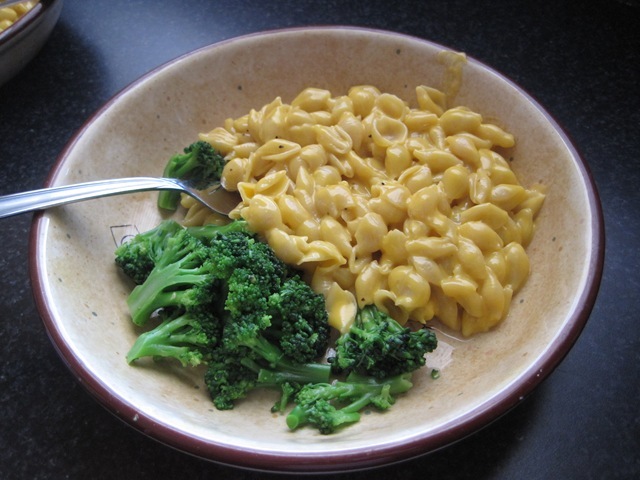 We joked on our run that we didn’t want the healthy version, we were going for velveeta. You only live once! 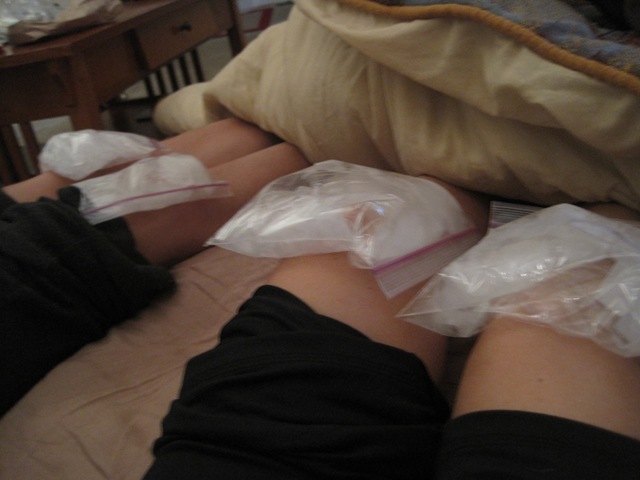 We iced our knees and watched ELF (the Christmas movie). It was the best way to spend the day after our long run. I’m now home and extremely sore! 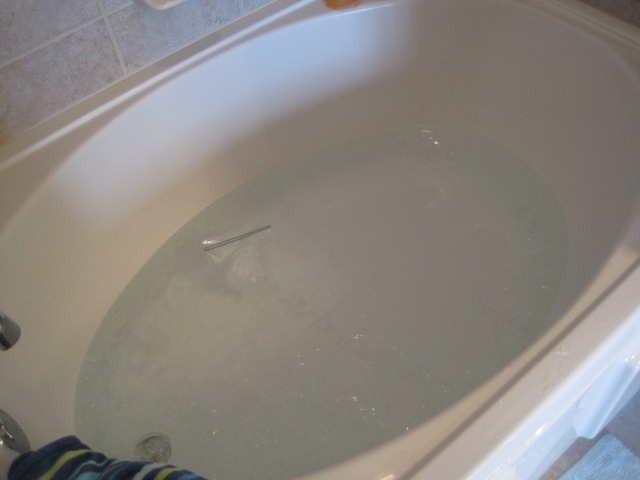 I need to do some stretching and ice my knees again. Today is the very first time since I started marathon training that I can actually say that I think a marathon is attainable. I seriously NEVER believed that I could do it. 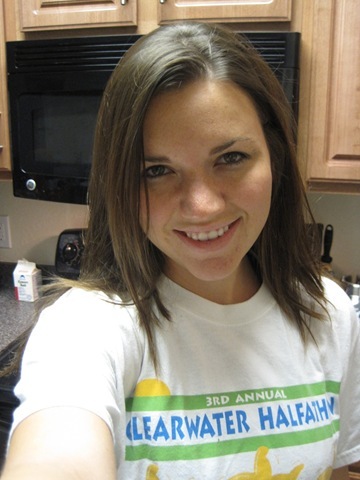 I’m really excited, and I know I could do a full marathon! My Longest Run Yet: 15 Miles! That’s my super excited face. 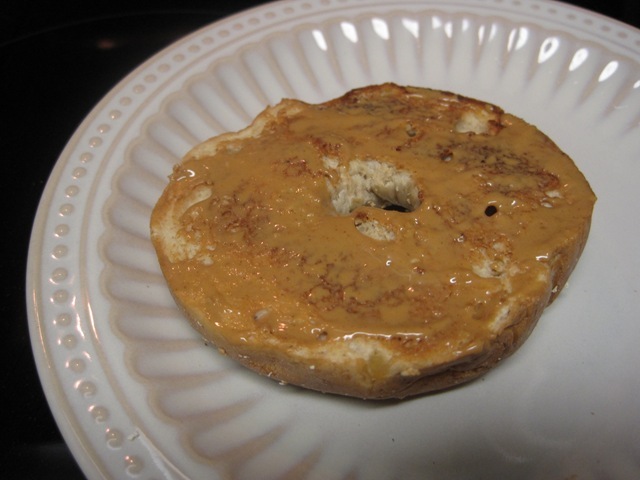 Before I left the apartment, I fueled up with a half honey bagel with PB. I finished the remaining 8.0 miles on my own. I really didn’t know if I could do it! I have never run that far, and never more than 8.0 miles on my own! I actually ran faster by myself, because I was already warmed up, had nobody to talk to, and just wanted to get it over with! Mentally, I broke the run up into little chunks. First 7.0 miles with Kelly, only 3 more miles to a shot block, only 3 more miles to the next, only 1.5 miles to fill up my water bottle, etc. 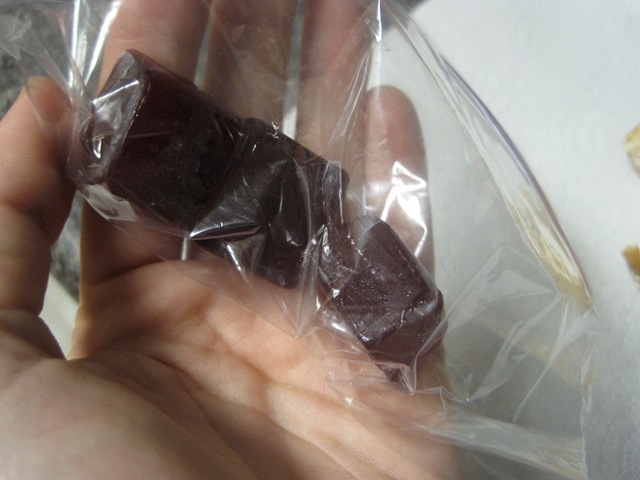 Dark cherry Shotbloks: Miles 7,10, and 13. I’m so proud! A few years ago, I couldn’t run 1.0 mile. Hard work pays off, you just have to really want it! 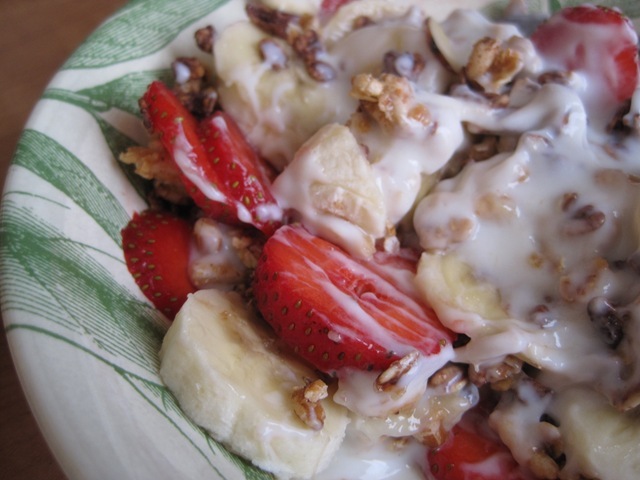 strawberries… which I got tired of cutting! 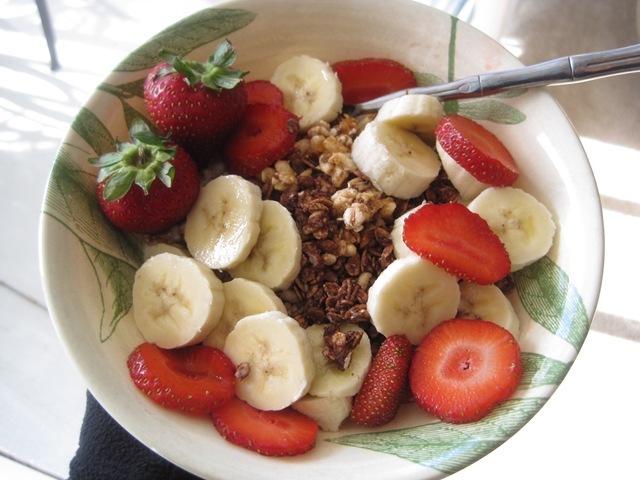 It tastes better once it’s all jumbled up! Next item on the list? Haha. Yep. 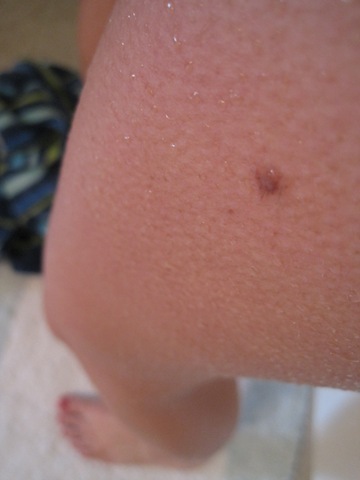 It hurt. I’ve done it a couple of times before, so I was prepped for pain. 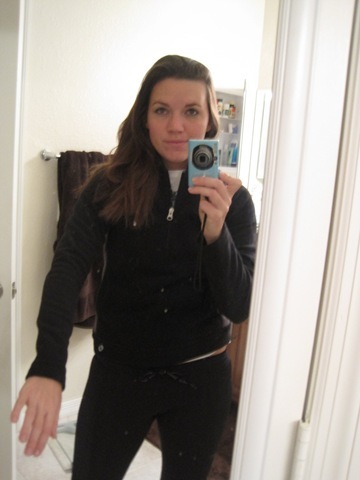 I wore a fleece hoodie to stay “warm”. My legs were sore all over. I figured dunking them in ice was faster than individually icing each area. 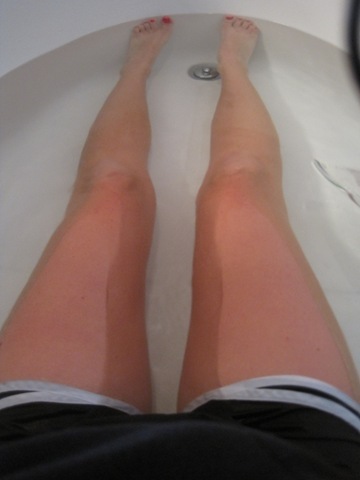 Once I was all the way in, they went slightly numb feeling and then it wasn’t bad at all. 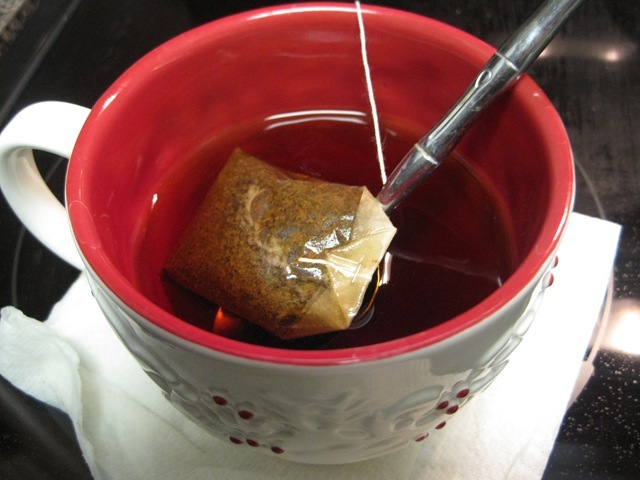 …and a cup of hot pear tea! 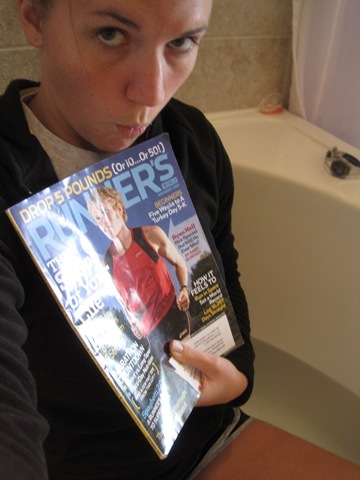 …and of course, Runners’ World magazine, and my camera for entertainment. I never thought I would ACTUALLY be training for a marathon. 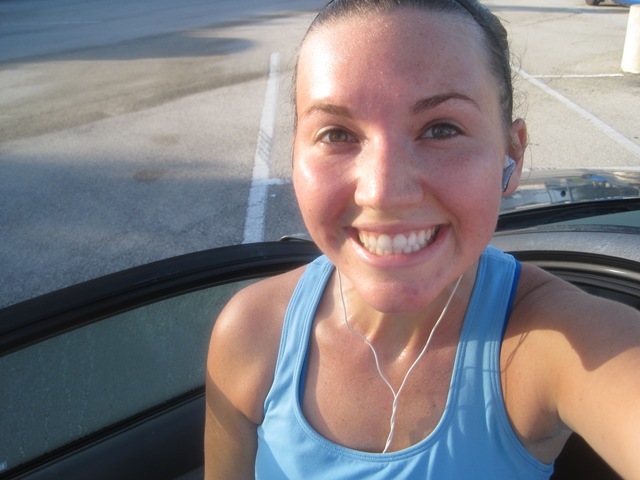 For the past three years, I have been training for 5k-half marathon distances. Not until today have I actually felt like I was MARATHON TRAINING! Now that my long runs are exceeding half marathon distance, it feels for real. 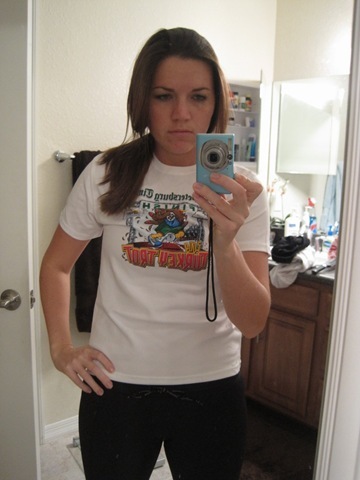 Disney Marathon… here I come! I ran a half marathon this morning! 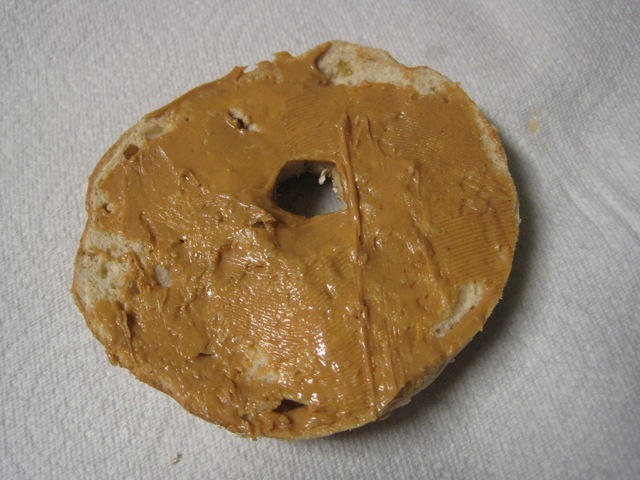 I started my morning with a 5:00 am wake-up call, and a half a bagel with PB. 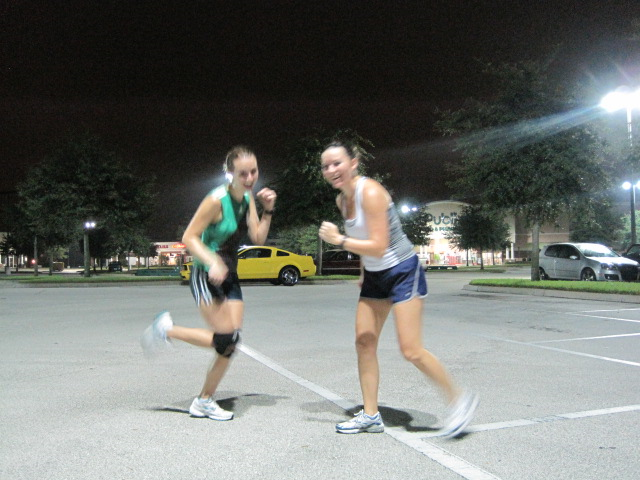 I met with Caitlin at 5:30 am to get our long runs in. She had 16.0 miles on the schedule, and I had 12.0. We figured running the first 12 together would make things go by faster! Miles 0.0 thru 7.0 were run in the dark! 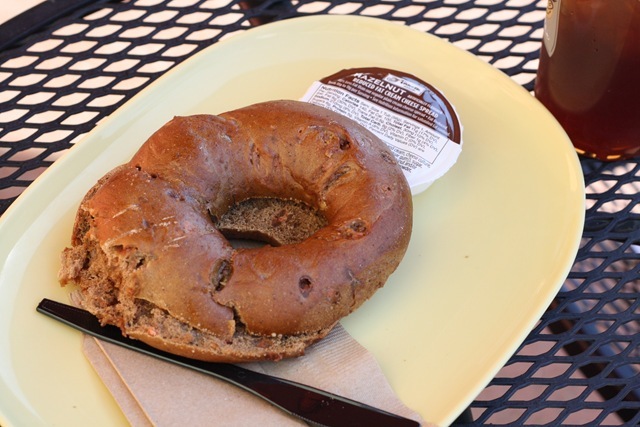 I made the mistake last time I ran 12.0 miles of waiting until after 10.0 miles to eat something. This time, I ate BEFORE I felt like I needed it, around 6.0, 8.5, and 11.0. 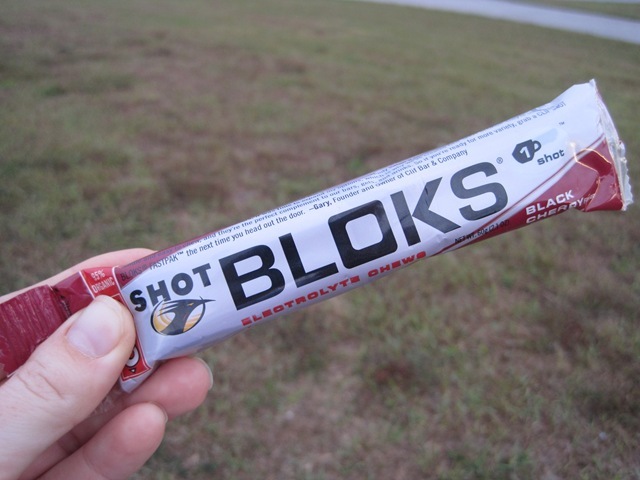 I tried these black cherry CLIF shot bloks which I really liked! The had caffeine in there which I think really helped! Caitlin and I took about 4 mini breaks. We walked for a few seconds, Caitlin once had to tie her shoes, to stretch, etc. It’s okay to walk, stretch, whatever! I’m all about doing what feels best on long runs. 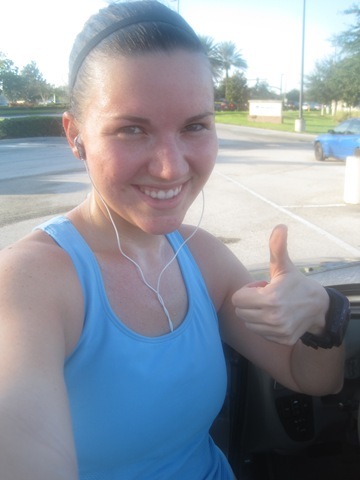 I had 12.0 miles on the marathon training plan, but I was feeling great! I decided to go ahead and run 13.1! I didn’t feel bad about running extra, because before my mini-shin-injury, 13 miles were on the schedule for this week. 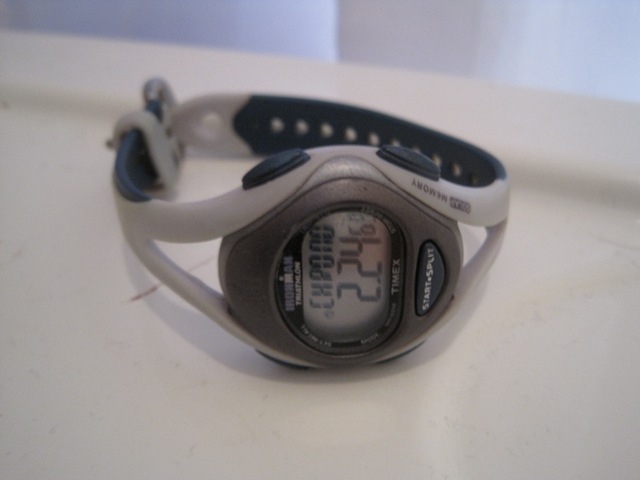 I’m not sure how long it took to run 13.1 miles, because my Garmin got messed up (I talk about it in video 2). I’m guessing around 2:16:00!! I have two vlogs for you!!! 1st Vlog: Caitlin stops to change her socks, and I get bored. Check out how sweaty we are!!! It’s 86 degrees at 7:00 am!!! 2nd Vlog: My thoughts after 13.1 miles. 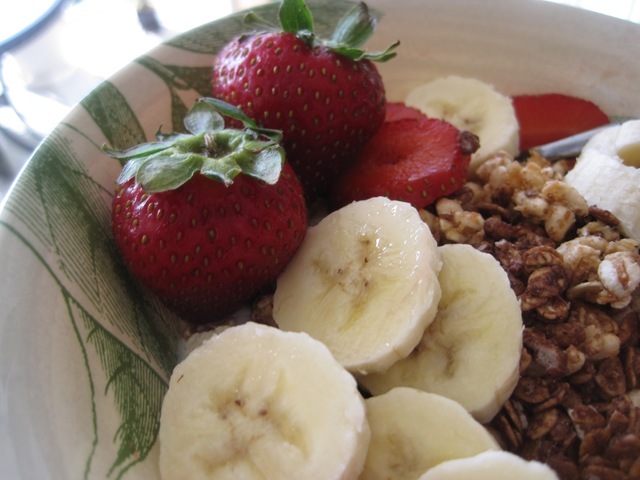 When I first got home, my tummy wasn’t feeling BAD but I wasn’t hungry either. Chocolate milk was just what I was craving! 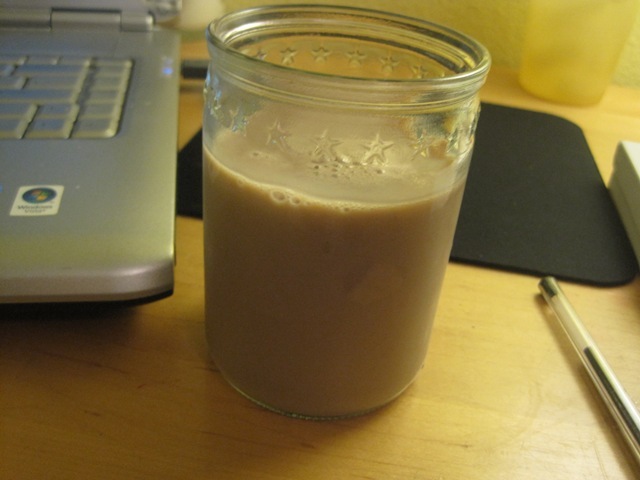 It has plenty of protein (1.5 cups homemade chocolate milk = 165 calories,13g protein, and 23g sugar/carbs!) 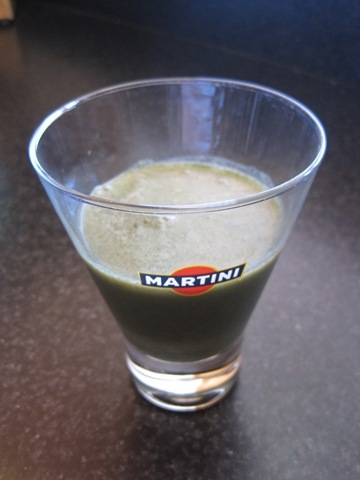 It’s a great recovery drink! 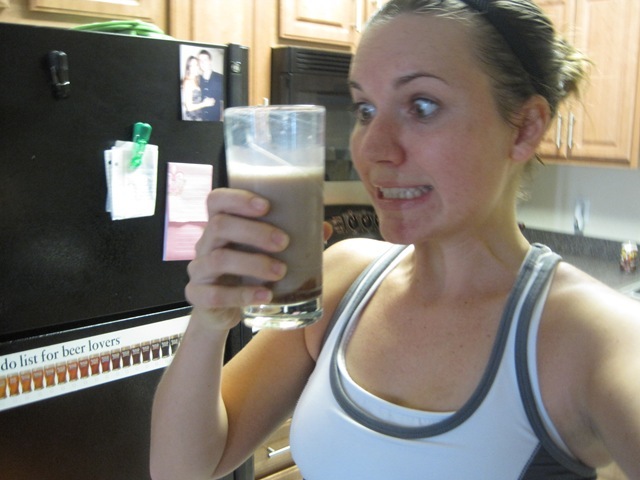 This is my “I’m so excited to drink chocolate milk!” face. LOL. After my shower, loading videos, etc. I finally got hungry at 10:15 am or so. 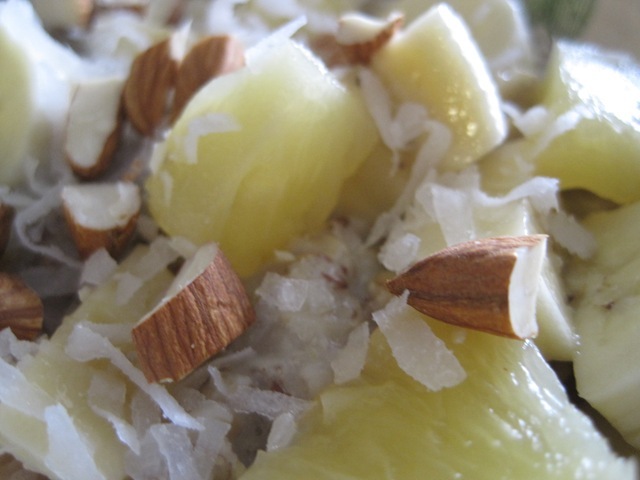 I made my tropical oatmeal! This meal is SO filling, I love it. WOW that’s a LOT of stuff!! Very worth the time it takes to make.